I have a love for pesto sauce and thankfully I’ve passed that love onto my chicken. 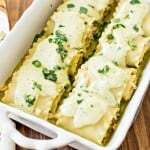 Friends these Creamy Pesto Sauce Chicken Lasagna Rollups are SO good and topped with the Garlic Basil Sauce they are downright amazing. I love that you can make it easily for a weeknight dinner and it’s great with leftover chicken. If you’re a fan of pesto sauce, you’ll want to try this recipe. What’s great is that the pesto is mellowed out by the creamy sauce, so even my picky kiddo loves it. And it’s covered by a creamy garlic basil sauce… oh so good! 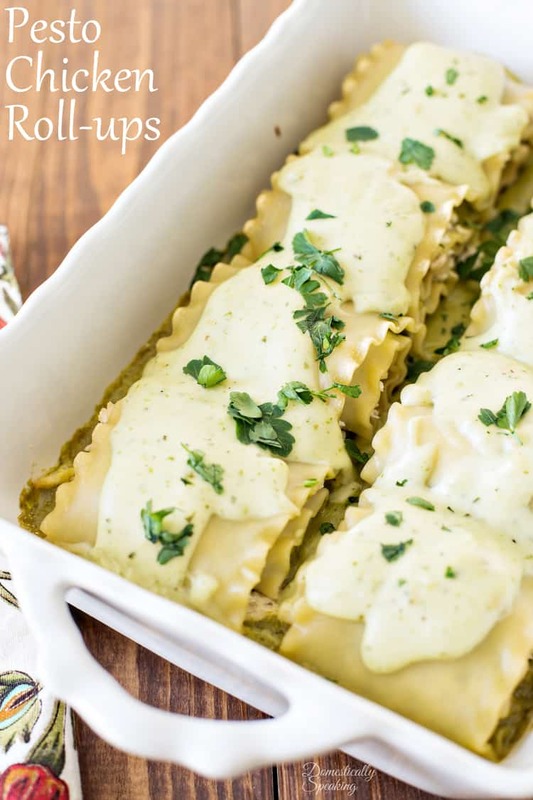 These Creamy Pesto Chicken Lasagna Rollups look so fancy, but they are easy to make! Bring a large pot to a rapid bowl, add 1 teaspoon of salt and the lasagna noodles. Cook until al dente - usually about 7-8 minutes. In a saucepan combine the can of cream of chicken soup and the pesto sauce. Stir until it's warmed. Once noodles are cooked, drain and lay on a flat surface (I put aluminum foil underneath). Scoop about 2 tablespoons of the pesto sauce on each noodle and spread over the noodle. Sprinkle the cooked chicken on top. Starting at one end of the noodle, roll up the lasagna noodle. 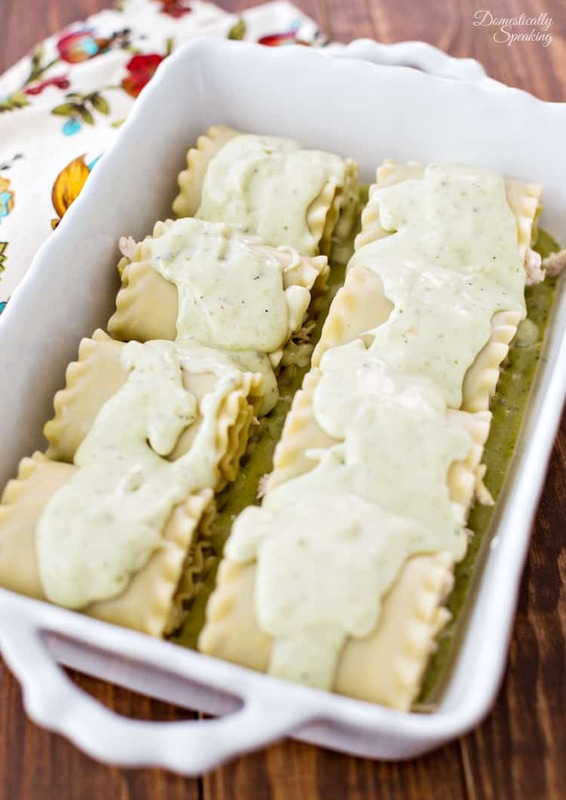 Place seam down in a baking dish that you've poured the remainder of the pesto sauce into. Repeat until all the noodles are rolled up. In another saucepan melted your butter. Add the minced garlic and the flour. Cook over medium/low heat for about a minute while continually stirring. It will be a thick / paste like substance. Slowly pour in the milk, continuing to stir. Add the chopped basil, Parmesan cheese and salt and pepper to taste. Let it simmer on low for a couple minutes, stirring. Pour the Garlic / Basil sauce on top of the Pesto rollups. Bake in a 375 degree oven for about 20 minutes. 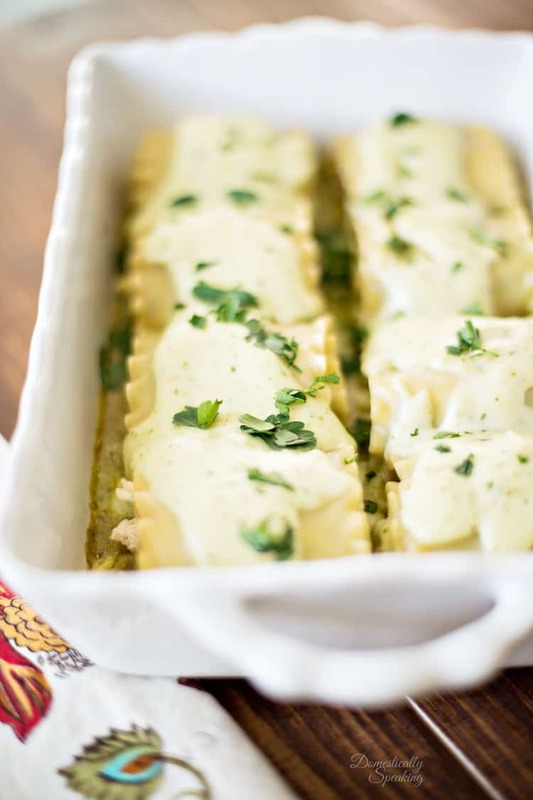 I hope you and your family love this Pesto Chicken Lasagna Rollup as much as we do. The directions were a bit confusing. I combined the soup and pesto sauce but the directions don’t say where to use it? Is it what you’re calling pesto sauce in direction #3? Is it the soup pesto mixture or just pesto? Not sure how it will turn out as I just used more pesto, not the soup pesto in the chicken roll up. Dumped both sauces on top! We’ll see?! This sounds delicious! I am definitely making this soon. This looks delicous. In the ingredient list it says ” 1/2 pesto sauce”. Do you mean 1/2 a oup? On the pictures you show 2 different things. Do you use 10 or 8 noodles? Dominique you use a full box of lasagna noodles (as in the recipe) – I believe there’s 12 noodles in the box. Depending on the size of your pan you may need to use more than one. OMG this looks delicious! Thanks so much for sharing at Merry Monday!